For the exhibition The Relentless Repetition of Reality The Green Parrot has produced a photographic limited edition by Basim Magdy. 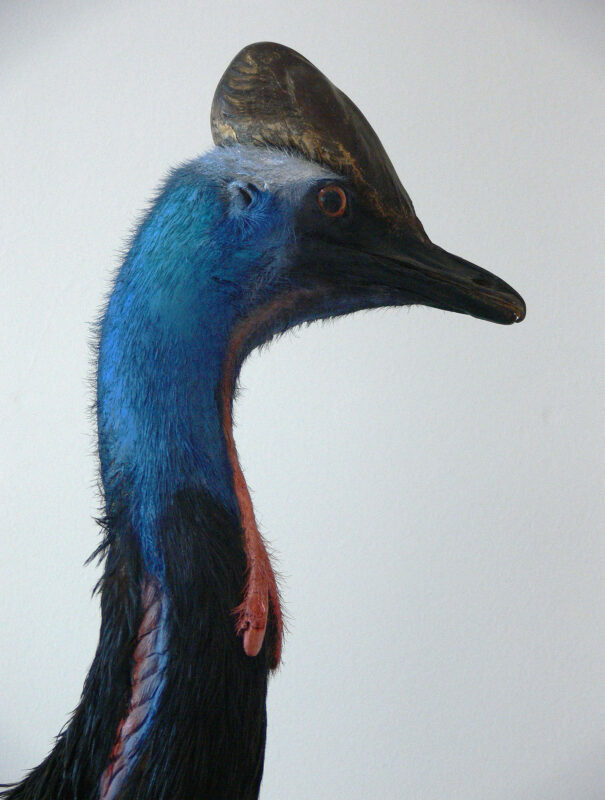 The edition displays a picture taken years ago at a natural history museum of a taxidermy Cassowary. Magdy’s recurrent investigation of memory processes lead to his interest in taxidermy as a way of fixing recollections and therefore preventing them from fading. The Cassowary is the third tallest non-flying bird and one of the most colorful, it lives in New Guinea and parts of Australia and it is considered to be a vicious and agressive bird. Basim Magdy was born in 1977 in Assiut, Egypt, and lives and works in Basel and Cairo. His work appeared recently in exhibitions and screenings at The New Museum Triennial, New museum, New York, Museum of Modern Art, Warsaw, Warsaw; HOME, Manchester, UK; La Compagnie, Marseille; Lismore Castle Arts, Lismore, Ireland (2015); La Biennale de Montreal, Montreal; Monash University Museum of Art | MUMA, Melbourne, Australia (2014), MEDIACITY Seoul Biennial, Seoul Museum of Art, Seoul; Passerelle Centre d’art contemporain, Brest; CRAC Alsace, Altkirch (2014); 13th Istanbul Biennial, Istanbul; Tate Modern, London; Centre Culturel Suisse, Paris; Sharjah Biennial 11, Sharjah, UAE (2013); La Triennale: Intense Proximity, Palais de Tokyo, Paris (2012); Kunsthalle Wien, Vienna (2011) among others… He was shortlisted for the Future Generation Art Prize, Kiev (2012) and won the Abraaj Art Prize, Dubai and the New:Vision Award, CPH:DOX Film Festival, Copenhagen (2014). He was announced Deutsche Bank’s 2016 Artist of the Year.